Use UpContent as it was meant to be by navigating away from the Hootsuite Stream and to the Publisher view. While you can use UpContent in Hootsuite in either the Stream or Publisher view, the Publisher view retains all of the interface and functionality of our native app at my.upcontent.com - making it easier for you to view and interact with content. 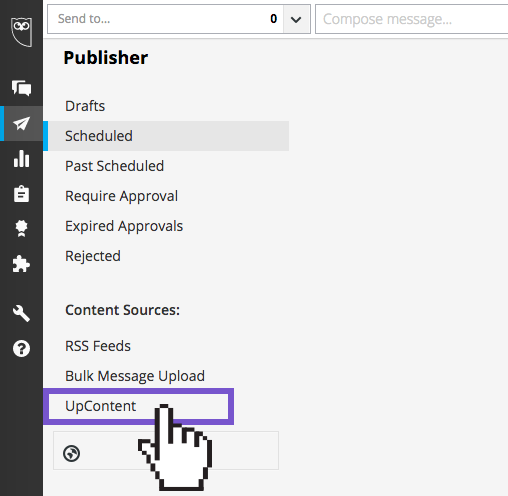 After adding the UpContent app in Hootsuite, you can find the UpContent Content Source by hovering over the menu-bar and clicking on "Publisher". Then, at the bottom left of the screen, find UpContent amongst your Content Sources. You should then see the app load with all of your topics and resulting content.